Anyone remember that scene in the movie Love Actually, where the salesman at the jewelry counter is wrapping a necklace in agonizingly slow, meticulous fashion? I feel like I'm channeling him whenever I wrap something at the gift shop. It's not a super detailed process - a bag (but we have several colors/patterns to choose from), tissue paper (again with the colors), and curling ribbon (you guessed it - all the colors!) - and I try to go fast, and even though I'm chatting with the customer and they are usually being patient, the pressure of their imaginary hurry starts to get to me, and then I think about that scene in the movie, and then I have to stifle a giggle, because who would understand why I'm laughing at that point? It's never boring living in my head. Click here for a YouTube link to that scene, if you want to see it. The painting is done by Guy Benson - I first met him years ago when I worked at the Arts Council and he joined the art league. He entered a painting in a juried show, got some recognition, and grew into a really accomplished artist. And in the "it's a small world" scene, he and Jeff work for the same company, which is how Jeff was able to get in touch with Guy and make this happen. Paco wasn't too sure about this...the box was bigger than him! I got it set up and made my first cup of coffee - it was wonderful and I know I'm going to enjoy this! My parents gave me money to buy something fun when we go to Santa Fe this summer - haha, it's like they know me and my love of shopping! Plus I had several phone calls and cards from friends and family, and my Facebook page exploded with birthday wishes...I felt very spoiled all day and enjoyed every minute of it! 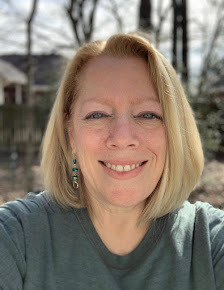 Being 52 is A-OK with me. Pattern is Miss Daisy, yarn is Berroco Touche, in a tiny size just for fun. I think it came out cute, but I probably wouldn't make this again - the 1x1 ribbing got really tedious. Miracle of miracles, it hasn't rained in almost a week! We are finally drying out, and might get to do a little yard work this weekend. Other than that, and of course our Saturday morning run, we have a pretty low-key weekend on tap - I'll take it! Have a great weekend! Now that's how to celebrate a birthday! So glad it was special and Jeff gets the big husband points for that gift. Also very glad to hear the rain has stopped. I bet your flowers are exploding in the heat. Jeff was really pleased with his gift - I think he's going to ride on this success for the next few years, LOL! I think we may have the same birthday! Your day sounded more exciting then mine though. I ha lunch with some friends, went for icecream an then hung out with family. I love th baby sweater! Happy Birthday! Hey, celebrating with friends, family and ice cream sounds pretty nice to me! Looks like you had a great birthday celebration! I liked all the gifts you received the painting is especially cool. 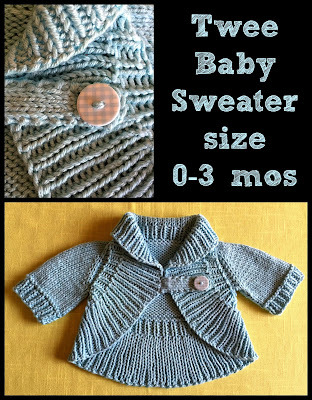 Baby sleeves are one thing - I can't imagine slogging through the sleeves of a men's sweater! I'd love to see a picture of it when you're finished. Is that you sitting in the driver's seat in the picture?! Nice. Looks like you had a great birthday. Happy belated birthday! Good eye - that IS me in the driver's seat! Jeff had asked me to back the car out so he could take a few pictures...not all that unusual, as we are both pretty entranced with the car. Didn't know he had an ulterior motive for them, LOL! Okay, I had to click through. I guess I haven't seen that movie??? Anyway, "so much more than a bag," LOLOLOL. I immediately had a picture of you in the gift shop giggling! Man, you totally got worthy presents this year. I love all of them! And I didn't see it until the comment, but I love that you are half-hidden in the driver's seat. You have GOT to watch that movie!!! I love the baby cardi. Wow. So nice. I know - will they forever be known as those characters? I LOVE that scene!!! (actually, I love "Love Actually" very much!!) LOL at you wrapping... And LOL at Paco gazing lovingly at the picture!!! Have a great weekend Shelley. Happy Friday - glad you got all the love and we couldn't live without our Keurig - it gets a lot of use with three coffee drinking adults in the house! I LOVE Love Actually! It's one of those movies I can watch again and again and never get tired of it. Mr. Bean's gift wrapping always makes me giggle. Sounds like you had an absolutely fantastic birthday! That painting is amazing! Great job Jeff! You are spoiled and totally deserved. The painting is beautiful! I love Love Actually, it's on TV every year around Christmas and every year we sit down and watch it, even though we know exactly how it goes and I know exactly when to have the tissues ready. It's the only romantic movie R. likes too.